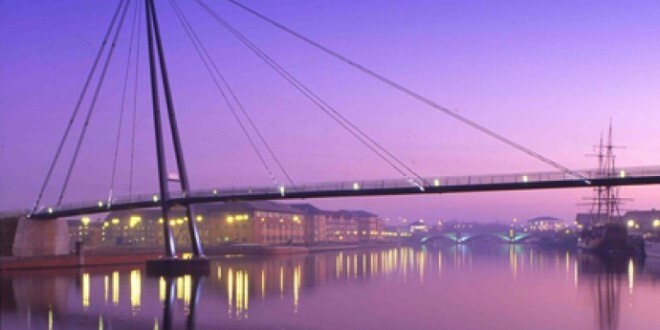 Information on Stocktons TeesQuay Millennium Bridge which was opened in 2000 and spans the river tees. Completed in 2000 this footbridge links Stockton’s Castlegate Centre with the campus of Durham University at Stockton and other new developments on that side of the Tees. It is suspended from cables hung from a 40 metre high mast and was built under a design and construct contract, won by a team comprising Ove Arup and Birse Construction North East and opened in December 2000. There are many new buildings on both banks of the river and a road runs along the riverbank on the town side. The bridge is popular with students and townsfolk alike, and good views of the river are obtainable from its footway. The bridge was opened on the 20th of December 2000 by Dari Taylor, Member of Parliament for Stockton South, and the mayor of Stockton-on-Tees. The Teesgate Millennium Footbridge was one of the few number of millennium footbridges to be actually completed in the millennium year, but unlike some high profile millennium footbridges it was not funded by the Millennium Commission.